Do you like playing sports? Okay, we can make it simpler. Do you enjoy playing as part of a team and having fun? Have you played, or considered playing, intramurals? At SNU, there are Intramural sports offered throughout the year. If you’re a student, I can guarantee you’ve received dozens of emails about sign-ups for intramurals. Maybe you’ve read some of them; maybe you’ve just ignored them. Or, perhaps, you might be one of the lucky students who play SNU Intramural sports. This year, two of the intramural sports that have already taken place are Sand Volleyball and Softball. The champions of Sand Volleyball were the Brotherhood team. Team 6, led by Cameron Hobson and Matt Wellman, won the softball championship. The results and any current information about the intramurals going on can be found at snu.uintramural.com. Jenae Acre, a junior, has played intramurals throughout her time at SNU. This semester, she’s played sand volleyball and is looking forward to playing football and indoor soccer. Scheduled during the spring semester, indoor soccer is Acre’s favorite intramural sport. “I enjoy intramural sports because it is a chance to compete with and against friends. And, it’s also a way to make new friends,” said Acre, who plans to keep playing intramural sports until she graduates. For those who worry about participating in intramurals because of a lack of athletic skill or experience, that shouldn’t stop anyone trying out intramurals. “Intramurals are a great way to compete as well as fellowship with other people. Regardless of skill level or experience, intramurals are fun for everyone to come out and participate in,” said Haley Brown, a junior at SNU. During Brown’s sophomore year, after she had stopped playing college basketball, she discovered intramurals as a great way to still be able to play sports on a team. This year, Brown is one of the I-Captains who help to run intramurals. “As an I-captain you help draft teams for the all upcoming Intramural sports events and make sure they’re running properly. You are a leader on the team, so every action on the field and how you handle yourself in every situation is important,” said Brown. Brown chose to become an I-captain because of her love of sports competition. If you’re competitive and get a thrill from participating in competitions and you haven’t played intramurals, you should definitely check them out. If you’re non-competitive but enjoy being part of a team, you should check out intramurals too. Regardless of how great or terrible you are at sports, participating in intramurals is one way to get involved and to meet new people at SNU. “My favorite thing about intramurals is the involvement opportunity it provides for students and the effect it has by drawing people together through sports competition,” said Brown. 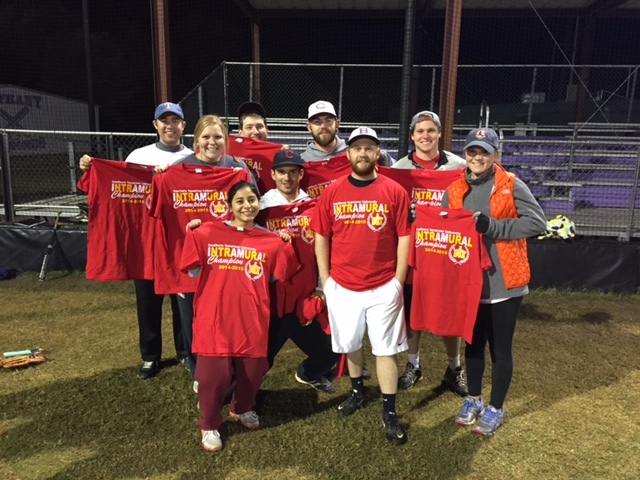 Not to mention, if you happen to be on a winning team, you get a pretty neat Intramural Champion shirt. And hey, what’s not to love about that? If you’re interested in knowing more about the intramurals going on, be sure to check out snu.uintramural.com.